The portals of Christ University were reopened for her students for the academic year 2012-13—2 June inauguration of I and IV trimester MBA, 4 June inauguration of III, V, VII, IX Semester undergraduate and III/V Semester postgraduate programmes, 5 June inauguration of III, V and VII BTech and MTech programmes. The fresh batches of Christites of I Semester BA, BSc and BCA, BBA, BBM, BHM, BCom and LLB programmes were welcomed to the University Campus on 11 June and I Semester BEd and postgraduate programmes on 18 June respectively. The fresh batch of I Semester LLM, MSc Chemistry, Physics, Mathematics and I Semester MPhil were inaugurated on 25 June 2012. Dr Fr Thomas C Mathew, Vice Chancellor, Christ University, welcomed senior and new Christites with his ever-charming smile and addressed the students on “Transforming Education-Transforming Learning.” He said “Your perception of learning and the learning environment, will depend in the light of your motivations and expectations, which determine how situational factors influence approaches to learning and learning outcomes set ahead.” Later, the new entrants to Christ University were briefed about the campus culture. Orientation programmes were conducted for the freshers, including the students of International programmes, following the inauguration. The Heads from the Offices of Student Welfare, Examination and Centres of Counseling and Social Action briefed the freshers about their offices and centres. The students were provided with a booklet on Library Facilities, Information Technology Services which could be accessed through web-links and learning support services. 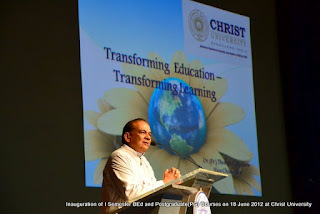 The inauguration was also attended by parents of the new Christites and the faculty members. It was an amazing occurrence for the outgoing Christites of Batch 2012. 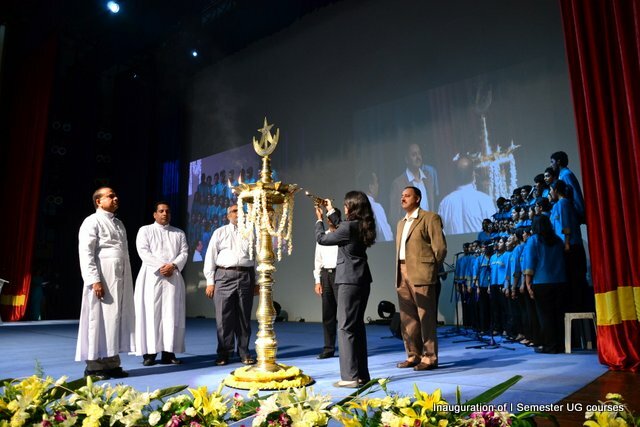 The convocation was held in three phases. The undergraduate and postgraduate students of The Deanery of Humanities and Social Sciences had their convocation ceremony on 26 May 2012 from 11.00 am to 01.30 pm. The students of the Deanery of Commerce and Management—BCom, BBM, BHM—had their convocation ceremony from 05.00 pm to 08.30 pm the same day. The following day, 27 May 2012, the students of the Deanery of Commerce and Management—MBA, MCom, MFM, and MPhil—School of Education, School of Law and the first batch of PhD students too had their convocation ceremony from 05.00 pm to 08.30 pm. Hon. 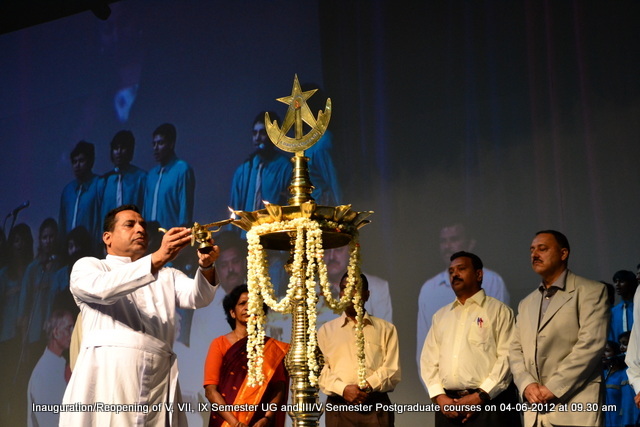 Chancellor Dr (Fr) Thomas Aykara presided over all the three sessions of the convocation. The Chief Guests were Hon. Mr Justice R V Raveendran, former Judge, Supreme Court of India, for The Deanery of Humanities and Social Sciences; Sri Anand Pillai–Sr EVP-Business Transformation, Reliance Industries Ltd, Mumbai for The Deanery of Commerce and Management students (BCom, BBM, BHM); and Prof D Narasimha Reddy, Member-UGC and Former Vice Chancellor, Jawaharlal Nehru Technological University, Hyderabad. They gave their valuable messages to the young graduated Christites of Batch 2012. All the three sessions were started with procession from Block II to the Auditorium followed by the formal convocation ceremony. Dr (Fr) Thomas C Mathew, Vice Chancellor, Dr (Fr) Abraham V, Pro-Vice Chancellor, Subramanian J, Registrar, were accompanied by the Deans, Associate Deans, HODs and Coordinators chaired the sessions on the dais. The Christ University Alumni President welcomed the Batch 2012 to the Alumni family. The rank holders were falicitated with gold medals. Faculty members, guests, parents graced the occasion and took part in the joy of the graduates over lunch and dinner at the University quadrangles.